I've been making my way through my skincare and personal hygiene products and re-evaluating whether they're the best option for my skin. I love natural (i.e. paraben free, non-comedogenic, cruelty free etc.) brands and formulas not only because they are better for you but because I they really do make my skin happier and healthier than their chemical-laden counterparts. Most items have made the cut, but one obvious exception was my deodorant. I'd been using the Tom's of Maine powder scented anti-perspirant formula for months (a gateway product that led to my love of Tom's fluoride-free toothpaste) but I wasn't in love with the aluminum-free version of it and continued to buy the regular rendition. Why aluminum-free and non-anti-perspirant you may ask? Well that question has many long and uncertain answers all over the internet (some info. here, here, and here) but I support the idea that sweating is a natural function and hindering it is hindering the release of toxins. In addition, aluminum in formulas (which is what blocks the perspiration) is said to intervene with our bodies hormones. While there is no evidence for it directly causing breast cancer (the most dramatic of the claims against aluminum), I think that an unhealthy disruption to our bodies should be taken into account. While it is probably safe to keep using whatever brand and formula you like, I put myself in a path of more natural beauty products and this was a pretty important one. The most immediately beneficial byproduct of using aluminum-free is of course, the end of stains on the underarms of white shirts and blouses (which is caused by the aluminum, not perspiration)! To conclude the very long, winded and internet-research-spurred story short - I decided to purchase the Burt's Bees aluminum-free spray deodorant first after reading about it here. I was taciturn when I put it into my basket but also looked forward to the (possibly painful) transition that would culminate in a new and improved version of myself, sans carcinogens. Burt's Bees Outdoor Deodorant with Oil of Sage : My deo du jour as I mentioned is a spray formula by Burt's Bees. It works fine and decreases odor as it is meant to. However, I don't love the smell and could do without the burst of cold oils on my skin on winter mornings. My goal is to find something that works just as well but smells a little less of herbs and spices. Schmidt's Natural Deodorant (Rose + Vanilla) : From here on out it is all rose-scented delights. I'm obsessed with rose products (Exhibit A: here) and the first on my list is this Schmidt's Rose + Vanilla formula. I seem to have put it in my mind that this brand only made products with hand application (from a little pot, not my cup of tea) but I found they also make stick deodorants in a variety of cool scents. The rose and vanilla is going straight into my shopping list. 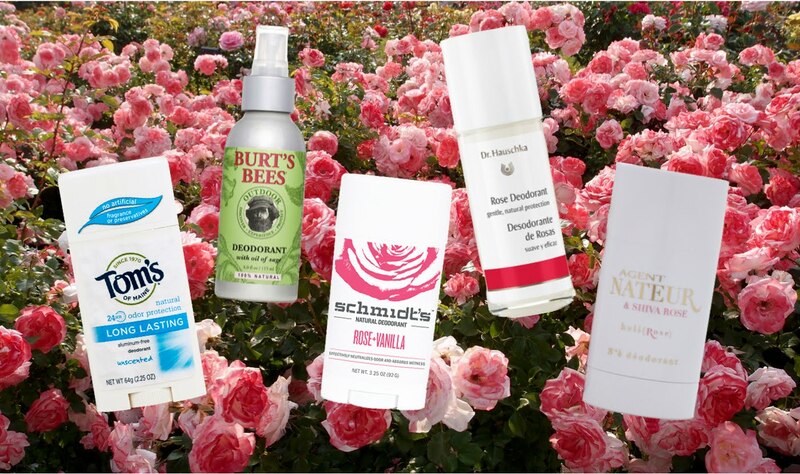 Dr. Hauschka Rose Deodorant : Now, these last two products are a bit of a splurge when it comes to deodorants so I probably won't try them unless the Schmidt's completely fails me. However, they are both rose-scented which is enticing and I have heard great things about Dr. Hauschka products in general - which is why this is first on the splurge list. The downside is the roller ball application which is a little too retro for me but the product has great reviews. Agent Nateur holi(Rose) N. 4 Deodorant : This last one has very mixed reviews around the internet. I love the website and the story behind the product but have heard some negative things about coconut oil-based formulas. Some more research is in my horizon but I thought I'd mention it for the sake of inclusiveness. Deodorants seem to be very hit or miss because they work so differently for everybody - the combination of skin sensitivity and natural body scents varies and so the most definitive way to go is probably to try if for yourself!